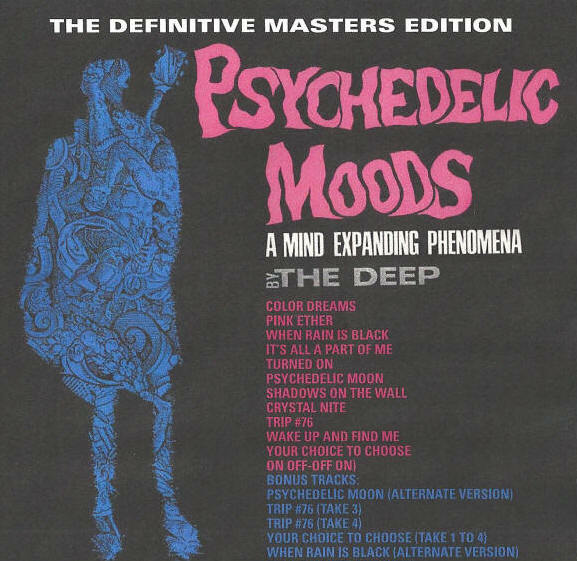 Issued in October 1966, “Psychedelic Moods” is the first album in the history of Rock music to incorporate “Psychedelic” in it’s title, beating out “The Psychedelic Sounds Of The 13th Floor Elevators” and The Blues Magoo’s “Psychedelic Lollipop” by one month. The album sold in minute amounts, possibly due to the unforeseen smash success of The Deep’s label mates, “Question Mark and The Mysterions’” whose hit “96 Tears” was number one on the charts. Since that time though, “Psychedelic Moods” has attained cult status as one of the definitive examples of the then newly emerging “psychedelic sound”. The album was intended to provide the listener with a simulated acid trip, replete with fuzz guitar, flute, backwards guitars, banjo, washboard, xylophone, wild sound effects, and love making. Songs such as “Trip #76”, “Psychedelic Moon”, “Pink Ether”, and “Color Dreams” explored the hallucinatory agony and ecstasy of a 12 hour Technicolor dream.